Inspired by Korean innovation, an ultra-thin fibre sheet designed to fit seamlessly on the face and enhance the moisture content within the mask leading to an increased absorption rate within the skin. 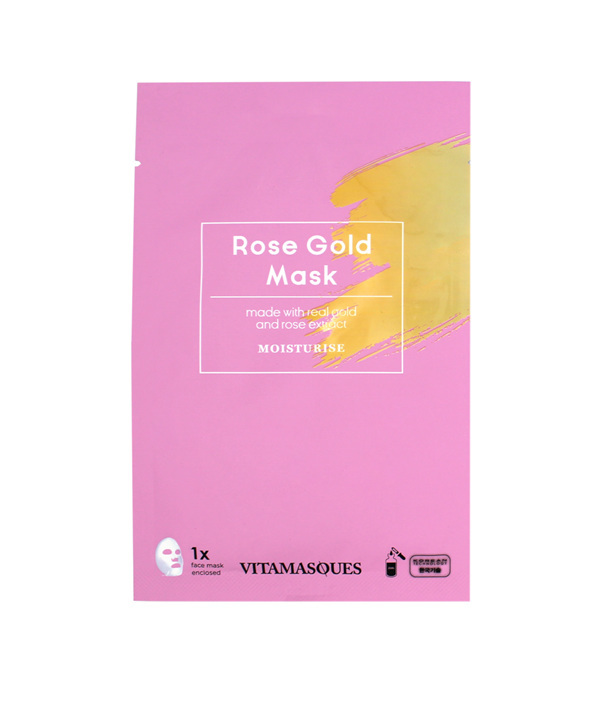 A rare blend from Vitamasques, our rose gold mask is specifically designed for dry, delicate and sensitive skin. Gold in the mask reverses skin dryness, which could lead to premature ageing. Rose oil saturates the mask with an array of vitamins, minerals and antioxidants that work best for dry skin and also offer antiseptic and astringent properties. Rose can also aid with uneven skin tone or hyperpigmentation. Great for: Uneven Skin, Sensitive Skin, Dry Skin Why use Vitamasques? Inspired by Korean innovation, a triple layer sheet technology designed to enhance the moisture content within the mask and lead to an increased absorption rate within the skin. Try adding VITAMASQUES to your skin care regimen and leave a review to let us know what you think! Made in South Korea.